Before I explain recommended thermostat settings for energy savings I’d like to point out the best and the worst thermostat locations. To maximize home energy savings and ensure the most efficient operation of your HVAC system, thermostat location should be chosen on an inside wall in a frequently occupied area of the house or the apartment. Additionally, thermostat location should be at least 18″ (46cm) from any of the house’s outside walls, and approximately 5′ (1.5m) above the floor surface in a location with freely circulating air of an average temperature. Thermostat locations you should avoid! Recommended Thermostat Settings / What is the perfect temperature for maximum home energy savings? Finding and setting your home at the right temperature is the first goal. Recommended thermostat settings during the winter or at least the best starting point for the cold season is 68°F. In the summer months, recommended thermostat settings is that of 76°F degrees (again for the starting point). As a rule of thumb, every 1 degree difference in thermostat settings will give you energy savings of 2% to 4% for a 24 hour period (energy used for heating and / or cooling). This will depend on your geographical location / climate zone, insulation, etc. 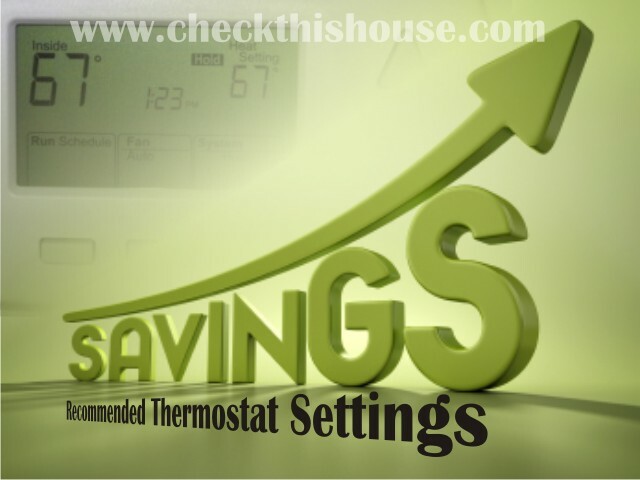 Let’s use this recommended thermostat settings profile as a starting point; if you are in the winter months and you have your thermostat set at 70°F degrees normally, if you can still feel comfortable by lowering it to 68 F degrees, you will be able to save up to 8% in your energy costs dedicated for heating purposes. In the summer, keep the air conditioning set at just 76 F degrees and turn on a fan. Doing this will pull out all of the humidity in the air and keep the temperature at a low level. If you can tolerate moving this more so, you will save money. If you’re still using old fashioned dial type thermostat, consider upgrading it to a digital / programmable one. They are not that expensive but can produce significant savings every year if properly used – about $180 every year. 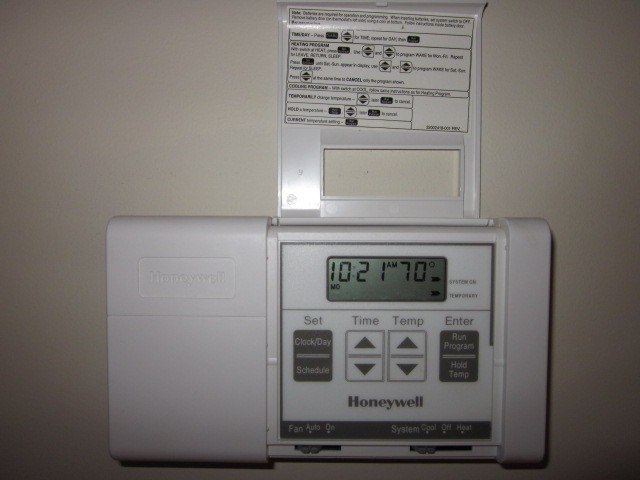 Programmable thermostats operate on the same principle as the regular once. Whenever the temperature drops below (heat cycle) or raises above (cooling cycle) the pre-set they turn ON and OFF your appliance. However, they have additional functions which will allow us to input recommended thermostat settings for energy savings into their memory to achieve maximum home energy savings. Depending on the thermostat model you might be able to set several time periods during each day of the week for maximum home energy savings. What’s the point of keeping the temperature at home at the comfortable level if nobody’s there to enjoy it – use recommended thermostat settings from the table below! When you go to work, send your kids to school, or take entire family for weekend getaway simply adjust the thermostat to conserve precious energy and set the time to be about an hour or two before you come home, and at that time, the comfortable / recommended thermostat settings for energy savings settings will kick in. When the time comes to turn the system on, they get the home to the right temperature efficiently. Once you start using recommended thermostat settings you will not notice any difference until you see that your next heating or cooling bills have dropped. I’d also recommend programming the thermostat for different temperatures at night when you are sleeping. Another of the great features of the programmable thermostats; you do not need to remember changing recommended thermostat settings for energy savings every day, as the device will take care of that for you once set. The recommended thermostat settings for energy savings below are pre-programmed in many (if not all) programmable thermostats. Play with it and keep checking your monthly statements. Remember, those recommended thermostat settings for energy savings are just a starting point for you. Since we all have different levels of comfortable temperature environment, you might need to do some adjustments. However, I would recommend to do it in 1° increments and giving at least a couple of days between the next changes of thermostat settings. Use recommended thermostat settings for energy savings and stay comfortable!